In the notes section of the relevant chapter of "Court of the last Tsar" there is a summary of the fate of each palace. I think the chapter is called "Country Estates". Greg and I later expanded the information he published in "Court of the last Tsar" by writing two articles for Royalty Digest Quarterly, if you are interested in finding out more. One of these appeared in issue 2, 2006, and is about Spala and Bialowieza, so you can read much more about the early history of these places and how Alexander III in particular used them (as well as the material on Nicholas, which is also fuller than there was room for in the court book). The information about their fate is also expanded on, especially Bialowieza. The second article appeared in issue 4, 2006, and covers the Warsaw palaces: Skierniewice, Warsaw Castle and Lazienki. The main characters in these tales are Konstantin Pavlovich, Nicholas I, Konstantin Nikolaevich and, again, Nicholas II - with more about Skierniewice than there was space for in the court book. THEN, we also put the Bialowieza stuff up on the internet, in the article on Directarticle, which is linked from this thread in several places. 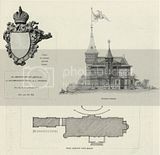 The purpose of that was to show the photos we have and lay out a ground-plan of the palace and estate. The text is largely the same as in the RDQ article, but rearranged a bit. The best photos of Spala and Skierniewice are Violetta's photos on this forum. Not my cup of tea, all those pictures of Nicholas looking down, but I know some people would love it - so whatever floats your boat! :-) The apartments themselves look wonderful. Ye are many; they are few. The books are in Polish, Russian and English — with lots of photos. BTW, our nearest neighbors are an older couple who immigrated from Poland. I got to hear native Polish pronunciations of all the place names: Spala, Bialowiesza, etc, etc.. It was music to my ears. BTW these names, Spała and Białowieża, both written with the ł with stroke, are a bit of a shibboleth in Polish: Untill the 1950s, apparantly, the Central and West Polish and current standard pronunciation with the ł pronounced [w], thus /Spawa/ and /Byawoviezha/ was considered uncouth. The East Polish (and Biolarussian and Russian) pronunciation with [l] was considered the noble standard, typical of the nobility's sociolect. Today it's apparently just theatrical. Does anyone know what the Romanovs thoought about Polish and Poles? Depends which Romanovs you mean. ;-) No Romanov Tsar ever behaved as if he liked Poland at all, though Nicholas I, Alexander III and Nicholas II spent quite a bit of time there. But Grand Duke Konstantin Pavlovich, who was sent there as informal viceroy of the Congress Kingdom, started by despising the country (he had almost autocratic powers over it), but slowly came to be a big defender of it, claiming before he died that he had spoken Polish so long he could no longer speak Russian. It's as if he found his purpose there, away from the shadow of his "golden" brother Alexander - and Poland's fate at the hands of his other brother Nicholas after the Uprising destroyed him. His namesake Konstantin Nikolaevich inherited his attitude as well as many of his estates - he was so pro-Polish as Governor-General that rumours circulated saying he was sponsoring independence and planning to set himself up as King soon! Like his uncle, he was summarily removed when things got out of hand. He named his son (born in Warsaw) Vyacheslav, knowing the name's association with Polish nationalism (Waclaw), and admired the free trade liberalism of the Polish economy (which he also tried to introduce in Russia). I think it's probably fair to say that later Romanovs had no thoughts about (Russian) Poland beyond its being a Russian province they could hunt in, at least until they were forced to consider the question during world war One. Margaretta Eagar found Poland dirty and squalid and said so in her memoir; this was the attitude of many aristocratic Russians as well (including those of Polish-Lithuanian descent whose families ended up as servants of the Tsar: Catherine Radziwill is a good example since she absolutely rejected her Polish heritage and considered herself a Russian who opposed any autonomy for Poland, let alone independence). Catherine Radziwill is a good example since she absolutely rejected her Polish heritage and considered herself a Russian who opposed any autonomy for Poland, let alone independence). Interesting. I get the impression from her memoirs that her abjuration of everything Polish stems from her adored Polish father going over to the Russian side, her maternal family being Russian (though her mother died shortly after her birth), traumatic childhood experiences during the insurrection in 1863 (during which her baby brother died), growing up in St. Petersburg, her father's estate lying nominally in Poland, but in a region inhabited by Ukrainians and of course marrying into a nominally Polish family that was part of the German establishment. It seems that she didn't even speak Polish. Anyone who knows how Polish her stepmother Jadwiga Jaczewska was? The most pathetic attempt at architectural Russification in Congress Poland must have been the transformation of the Classicist Staszic Palace in Warsaw into Russo-Byzantine style, just because it once had housed the Orthodox chapel of the captive Shuysky Tsars / brothers during the Time of Trubles. See http://en.wikipedia.org/wiki/Staszic_Palace After Poland regained its independence the Russian façade dressing was removed, just like the immense Orthodox Alexander Nevsky Cathedral was demolished. It is noteworthy to remember that the Romanovs rose to power after Russia had been humiliated by the Polish-Lithuanian Commonwealth. And yet, fanciful genealogies of the Romanovs claimed they descended from Prussia proper, which either was Polish territory (Royal / West Prussia) or a Polish fief (Ducal / East Prussia, from 1469 - 1701). What makes the Polish question fascinatingly complex is that there are actually are three different Christian confessions jostling for supremacy. Catholicism, Protestantism and Orthodoxy. An auction from the Yussupov collection has interesting photographs. Is anyone able to convert it to a jpeg (or make it bigger)? Thank you very much brnbg. A great research discovery of Bialowieza's plans!